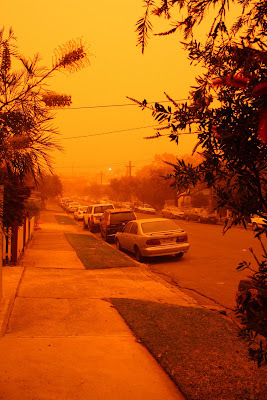 Strange weather in Australia recently: record high winter temperatures, bushfires in spring, hail the size of cricket balls overnight and we woke this morning to an apocalyptic orange glow in Sydney. Meanwhile our Prime Minister is at the UN for climate change talks and the domestic question is whether we should have our emissions trading scheme ready to go for Copenhagen or wait for the outcome of the Copenhagen talks and a post-Kyoto international agreement. In today's Sydney Morning Herald, economics editor Ross Gittins has a go at both parties about their complacent approach to climate change and then turns his gaze to population growth and to economists for ignoring the environment. Even the economists who brought us the emissions trading scheme don't adequately appreciate the problem we've got. They think all we have to do is switch to low-carbon energy sources (ideally by capturing all the carbon emitted by burning coal) and the economy can go on growing as if nothing had happened. Being economists, they see us as all living in an economy, with this thing at the side called the environment that occasionally causes problems we need to deal with. As usual, wrong model. In reality, the economy exists within the ecosystem, taking natural resources from it, using them and then ejecting wastes, including sewage, garbage, pollution and greenhouse gases. Not much to disagree with there, but I haven't seen Gittins talk about ecological economics before or what the alternative model might look like. (At the risk of caricaturing his columns, they seem to be, while interesting, a confusing mix of very staid conventional economics one day: 'if the politicians studied a bit of economics they'd realise that people will act in their self-interest and supply and demand will ensure such and such happens' with blanket rejection of economic ideas the next 'if economists studied human psychology, they'd realise that people don't act in their self-interest and so supply and demand can't be counted on' etc). But perhaps we can look forward to some ecological economic analysis from Gittins in the future. I have never seen an atmosphere which was seemingly like that. That would be so strange that the sky appears to be reddish. selam mornign burda günaydın bütün ismek kurs çalışanlarına teşekkürler. wow i haven't seen something like that. it so weird. did you edit the photo to enhance it or is it the original?